Penny S. Tee Happy New Year! We began the year celebrating New Year’s Eve 2018 on a cruise to Mexico. I’ve been blessed through my years to have been on many cruises from my single days (always a safer way to travel the world alone), to romantic getaways, family vacations and even temple women’s retreats . They’re always a great way to see the sights, enjoy plentiful food and libations and be catered to by obliging cruise staff. I’ve enjoyed the more extravagant, and those less pricey, and then there was the one years ago that I referred to as the X of the seas (I don’t want to get in trouble but you can fill in any low cost, low quality restaurant chain of your imagination — shall we say the food which is always something I look forward to — was less than appetizing. This time we were on Carnival’s ship Imagination, a fitting passage for a writer, although that’s not why we chose it. We wanted a value-priced, fun time during the kids’ winter break to chill out, celebrate 2018, see some fun sights, enjoy time with friends and let the boys safely enjoy time on the ship together apart from us — even the eleven-year-old girl in our group had activities to happily take part in at the kids club. Basically a little something for everyone’s tastes. The fact someone else had to plan and clean up after the party was the cherry on the cake. The boys I’m referring to are our son and his best friend. Our last trip together before our young men would be going off to college. “Just five months!” the dad’s decried, as they calculated how little time was left before high school graduation. Yes, both these men have been dedicated fathers every step of the way. It wasn’t just us moms suffering pain in our hearts at the thought that our babies were soon to go as nature intended — off to their new lives, ones that they would traverse and create for themselves. By the way Mr. Trump, and my readers forgive my rant but… their family is of Mexican heritage, both parents live legally in the United States, are college educated and have raised their precious children with such high family values that if anything had happened to us, we’d have wanted them to finish raising our beloved son. They are friends we consider family. What are you thinking…or are you enthralled with the sound of your voice no matter what spews forth? Sorry, but my outburst will continue just a little longer…Then of course there was Mimi, our cherished Latin American nanny we had when our son was a youngster. I’ll always be grateful for the love, kindness and moral values she showed him. Which is not to say that I wasn’t there every step of the way. I spent the majority of my time with my son by choice, but that didn’t mean I didn’t need help on occasion. And our Mexican housekeeper who’s worked for us for years. Yes, she does the work that I don’t want to do, and has for over a decade. I could always trust her with anything in our house, she’s reliable, does that yukky housework I loathe with a smile on her face, and has a kind heart. I appreciate her help every time she arrives with her cleaning supplies in hand. Where would I have been without their help? I’m sorry folks I’m distressed at what I read in the news. I have utmost respect for our country and the position of President of the United States, but wtf? How did we go from an African American president to a bigot? Being Jewish and raised amongst a rainbow of races and religions, how some have been portrayed and denigrated makes me angry. I apologize, but I had to get it off my chest. “The time is always right to do what is right.” And thus I cannot remain silent regardless if some people may stop reading or following me. I have to do what I think is right in good conscience. Amen. down regardless of the weather. 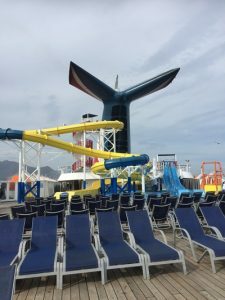 Although back home weather was in the eighties, our cruise was in the sixties, but this fact didn’t deter some children from indulging their excitement during the cruise. Brrrrr, only kids would make that choice between glee and comfort! greeted us when we returned to the room. If you want, you usually can find a class to teach you how to make these characters, although I’ve never been so inclined. But I’m sure I have a few more crafty-type friends who would take them up on the opportunity if the occasion arose. above the water and I wondered what magic the night would bring. always an artistic palette of colorful foods displayed like an artist’s canvas with designs carved into watermelons, an ice sculpture proclaiming 2018, and desserts looking and tasting yummy. From each deck came sounds of music, dancing and anticipation. We rang in the New Year with tunes, flashing 2018 glasses — our friend’s daughter looked like a rock star, and I couldn’t resist playing too. Silly hats, colorful undulating sticks heralding in 2018 — revelry abounded. friends and even trying to get the kids involved was great fun — at least for me. My son looked the least comfortable…”Mom must you grab my hands and swing them around?” Can’t you see I’m trying to be cool and avoid you embarrassing me? Oops, too late. I try to convince myself that someday he’ll look back on these memories fondly. Only time will tell. We went to the cruise show welcoming the New Year. It was impossible not to move with the pulse as the talented performers twerked on stage. I always admire singers and dancers — people who have the gift of grace in their bodies. I enjoy dancing but never would be accused of it being one of my strengths. Just a dabble for fun, and yes if I really wanted to do better I could. But my cost-benefit analysis says I’ll let others with more natural talent put in the work and I’ll enjoy ogling the fruits of their labor. See, I’m still putting my MBA to good use. 2018 ice sculptures floated across the pool and Jacuzzi and banners and streamers adorned the flights of decks and staircases. As we awaited midnight, I couldn’t help but wonder about how things will turn out in 2018. I had just finished my manuscript, and I knew it would be published during the year. Who would join my team to help me? So many blanks to fill in… I was so excited to move forward. My son would be going off to college. We both would be starting our new lives — huge, exciting transitions. As 2018 approached, thousands lined every inch of the interior decks. Balloons dropped from the top floors of the ship and we celebrated the New Year. I hope your’s was as much fun. 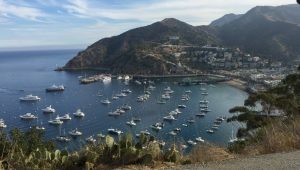 Our stop the next day was in Catalina so we weren’t worried about sleeping in, nor being able to communicate with the locals once we waddled onto shore. All of us had been to Catalina several times. I reminisced with my husband about our Cub and Boy Scout days camping at Cherry Valley and Emerald Bay. Me, actually camping on the sand at the beach…proving once again that we’ll do anything for our kids. A cruise is definitely more my style. Not the “dress up” nights that I tolerate (of course, I have some fashionista friends that have the more typical female reaction — loving donning their gowns.) However, we’ve sorely missed our scouting days as our son moved on to other interests through the years. They were truly some of the best times of our lives and we are grateful for the memories and the hundreds of pictures and videos to fill in the blanks of the details that fade with time. So much fun. In Cub Scouts my husband was the Committee Chairman and we’d have monthly meetings at our house that turned into feasts, driven by my Jewish mother’s nature — eat, have some more, did you try this? In my way of thinking, we had a party every month. Those friends who shared our boy growing up to be a young man, well our heartstrings will always be intertwined and I’m grateful. As our teen prepares for his last months in high school we often find ourselves looking back at our grand adventure raising him and our hearts are flooded with wonderful memories seared into our souls. Raising kids is as terrific and difficult as you hear, and I often tell friends who are starting out to capture every moment, photos, videos every sound and nuance because being parents is also every cliche you’ve ever heard…it goes by far too quickly. scooting slowly along the cliffs with a terrific view of our ship waiting for us on the ocean, and Avalon in the harbor below. As we stopped along the way, our friends told us that their son who had applied early decision to a few schools, had already had been accepted to two of them. I was so happy and proud of him and told him so. I asked his younger sister how she felt about her older brother going off to college. With that, she threw her arms around his neck and gave him a big hug. Between that and his decision to ride with his family so he could spend quality time with his younger sister, well the love in their family is always evident. One annoyance was that I finally caught the damn cold making the rounds throughout my family. My son had it for a week and a half, my husband now was working on his second week, and no surprise, and just in time for our cruise…here came my runny nose — disgusting. So far so good, just gross, not devastatingly stopping me in my tracks of having fun. I hear echoes of my parents in my ear about my Aunt being described as “Good Time Charley” Yep, I’m happy to say, I inherited that gene. In Ensenada the next day, we chose to do an off-road jeep tour to a winery. Each family on the tour had their own jeep and we formed a caravan on the bumpy dirt road to the winery. The wine drinkers amongst us were intrigued as Mexico isn’t known for their wine, even amongst our Mexican friends. We were surprised to learn that over 80% of the wine production in Mexico is produced in this area of Ensenada. the high-class wineries in Northern California. The buildings were made of stone, wood, cement and glass with contemporary art adorning the walls. 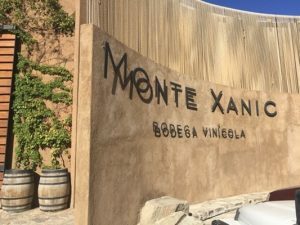 We were met by dignified and gracious hosts and given a tour of the entire wine process from the fields to the fermenting process, storage in the caves to the bottling. their logo with the modern impression of a flower. As far as the taste of the wine, it was met with mixed reviews. Some liked it and bought bottles to bring home, others found it to be bitter and watery tasting. Like anything, different palettes like or dislike wines or food according to individual tastes. cruising…relaxing on the water on a deck lounge chair watching the calm waves drifting by — my idea of heaven on Earth. It even looked like Jonathan Livingston Seagull decided to join me. options to go to the buffet or sometimes you might even choose to eat in your room. Cruising is filled with options that are fun to explore depending on your mood or with whom you are traveling. We were treated to the magic of a fantastic roaming magician during dinner who moved from table to table. He said that he was “working his dream job as he moved from ship to ship throughout the world.” I took his comment as a good omen for my own 2018. I too believe I will be working on, beyond giving birth to my son, what I was put on this Earth to do. Wish me luck. After dinner we went to an incredibly staged Epic Rock musical, complete with amazing choreography and costumes. It was so much fun to sing along and you couldn’t help but bounce your head along with the beat of the music. We finished off the night at the comedy club enjoying the talented comedian, Seth Buchwald. We only caught the end of Monique Marvez’s comedy, but I wish we had come earlier. It’s interesting because it was rated PG, we didn’t go. It’s a prejudice us newly freed, almost empty nester parents have to consider…just because something isn’t rated for adults only, doesn’t mean it won’t be funny. Lesson learned. So that was how we began the year — just how I love to spend time — with family, friends and traveling. I hope you forgive my agitation, I couldn’t be still and have decent people be maligned — especially by our top leader of our country which was founded by the pursuit of personal freedoms. God Bless the citizens of the United States of America and those who seek the privilege of the rights that we enjoy. Searching for Personal Peace & Celebrating International Women’s Day 2018 How many of you know that today is International Women’s Day 2018? It’s important in case you need a reminder. Copyright © 2018 – Penny S Tee.